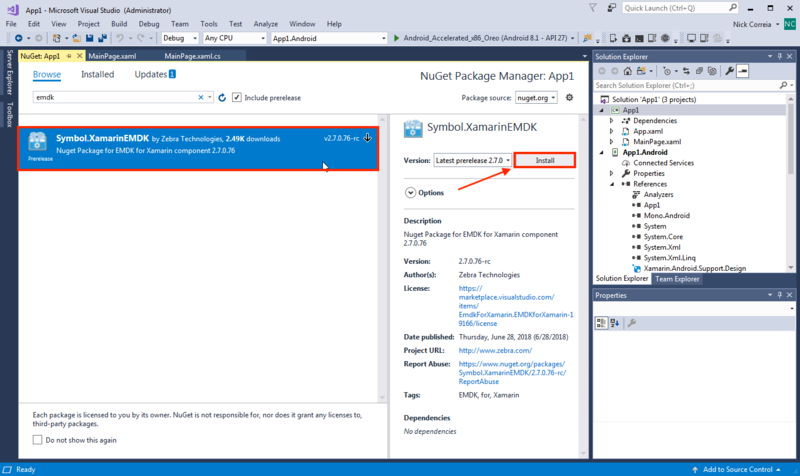 Starting with version 3.0, EMDK for Xamarin development tools are installed from NuGet packages and updated using the NuGet package management system. 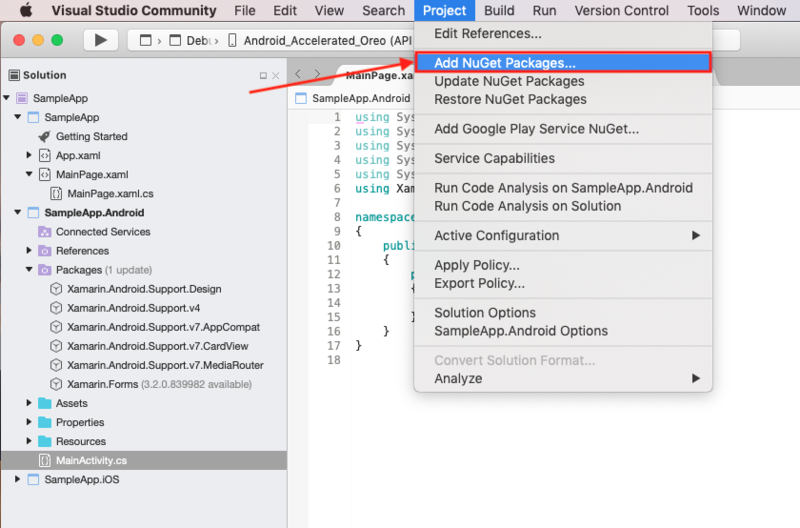 The EMDK-X NuGet package adds to Microsoft Visual Studio the API libraries required for building Android applications with Xamarin. The package must be added to any Android project before the APIs are available for use. Zebra recommends using EMDK-X with Visual Studio 2017. 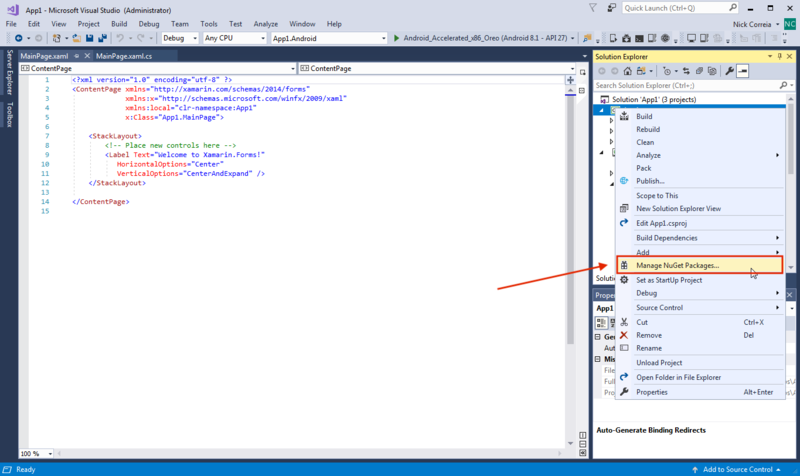 Attention Visual Studio 2015 users: EMDK for Xamarin supports Visual Studio 2015 only up to version 15.5. Upgrading to any newer version results in failure. Zebra recommends using Visual Studio 2017. The following instructions apply to Visual Studio 2017. A supported version of Visual Studio must be installed to complete the steps below. If necessary, install Visual Studio 2017 before proceeding. From within a project, right-click the project name and select "Manage NuGet Packages..." from the menu: Click to enlarge; ESC to exit. Click "Browse" (if necessary) and enter "EMDK" in the search box. The Symbol.XamarinEMDK package appears: Click to enlarge; ESC to exit. Select the package to show its info and Install button. Then click "Install": Click to enlarge; ESC to exit. Click the "I Accept" button to accept the license, if necessary. Click to enlarge; ESC to exit. 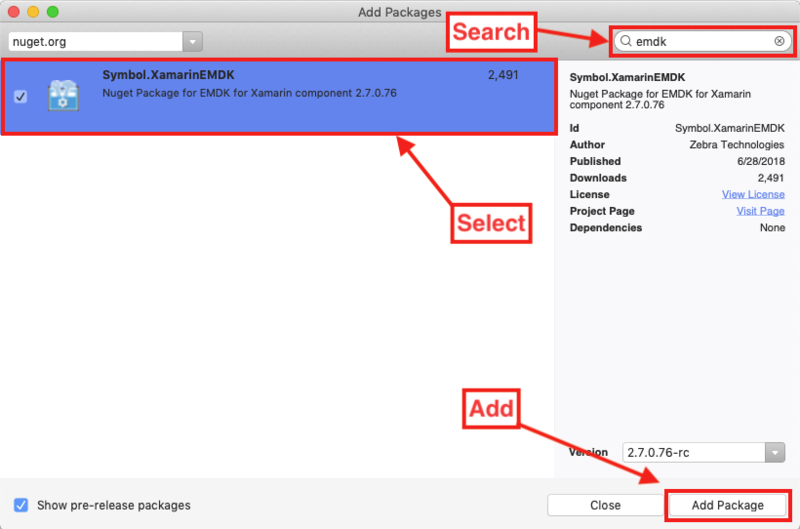 Repeat Steps 1–4 for each project that uses EMDK for Xamarin APIs. The project is ready to use EMDK for Xamarin APIs. The following instructions apply to Visual Studio 2017, which must be installed to complete the steps below. If necessary, install Visual Studio 2017 before proceeding. 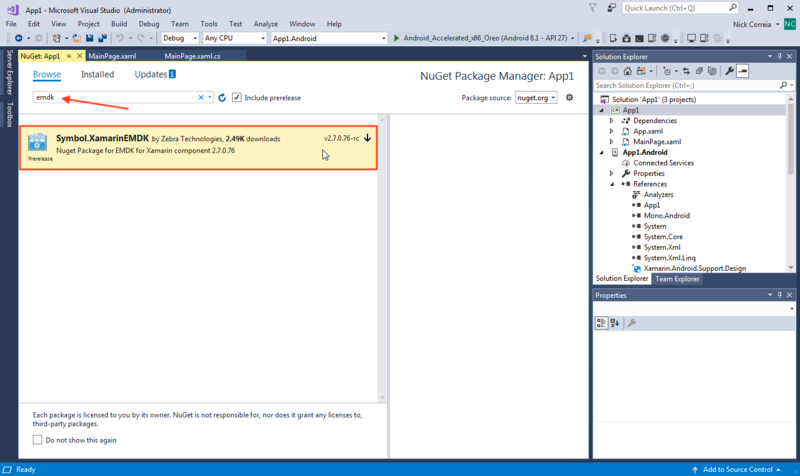 In the project, select Project -> "Add NuGet Packages..." Click to enlarge; ESC to exit. Enter "EMDK" in the search box. The Symbol.XamarinEMDK package appears: Click to enlarge; ESC to exit. 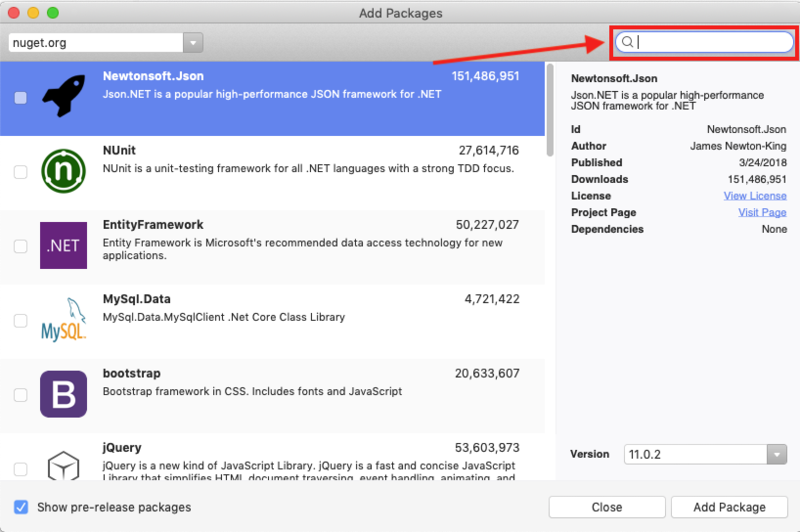 Select the package and click the "Add Package" button. Click to enlarge; ESC to exit. 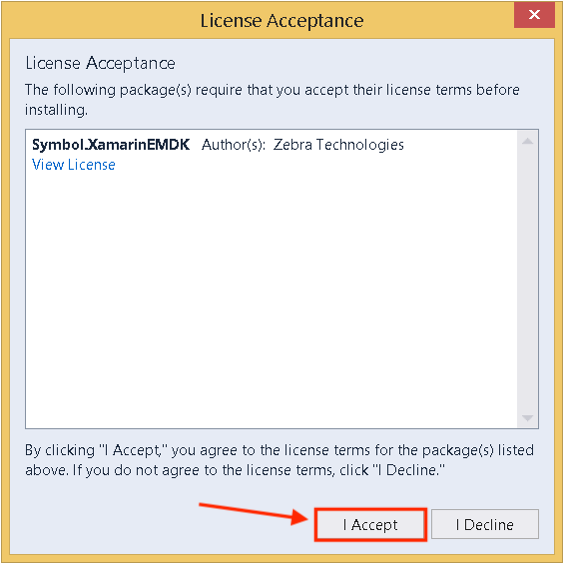 Click "Accept" to accept the license when prompted: Click to enlarge; ESC to exit. From within a project, right-click the Symbol.XamarinEMDK package and select "Remove" as below: Click to enlarge; ESC to exit.